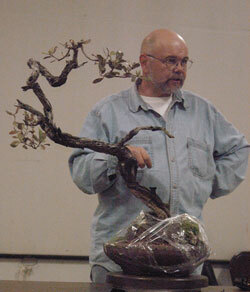 Ted began studying bonsai in 1979 in San Francisco, where he learned the basics under John Boyce. He moved to Los Angeles in 1980, where he became involved in a number of clubs and began a serious pursuit of the art, taking classes from leading masters in Southern California, including Ben Suzuki, Shig and Roy Nagatoshi, Melba Tucker, Warren Hill and John Naka. Ted was urged to get into teaching by Melba Tucker and he started offering classes at his home in Pasadena in 1988. Today, in addition to his own classes, he maintains a busy teaching schedule, traveling to nurseries, clubs and study groups throughout the state of California and across the U.S. for workshops and critiques. Also an in-demand demonstrator, Ted has conducted numerous programs (as well as workshops) at several bonsai conventions and conferences, and has been appearing more as a headliner/featured artist for major bonsai events. Along with Jim Barrett, he was the co-chair of the GSBF Convention XVIII in 1995 and, in February of 2000, chaired the California Shohin Society Seminar 2000. In addition, he has served as committee chairs for several GSBF and CBS conventions. Current memberships include Descanso Bonsai Society (a past president), Shohin Bonsai Society (a past president), the California Bonsai Society and Nampu Kai, a group comprised of John Naka’s students. He also is a co-founder of the California Shohin Society (a statewide organization devoted to the study of the smallest category of bonsai). He has served as an elected trustee of the Golden State Bonsai Federation, a statewide organization of clubs, for several years and was the Editor of Golden Statements for three years. (His articles have appeared in various bonsai publications and newspapers.) From 1998 to 2004, Ted served as the Chair of the GSBF Collection at the Huntington Committee, serving the needs of the permanent masterpiece bonsai collection at the Huntington Botanical Gardens in San Marino, California. He currently serves as 1st Vice President of the Golden State Bonsai Federation, and will assume the 2-year presidency of that organization beginning in January, 2008. Although Ted is a lover of shohin bonsai, his collection includes trees of all sizes, styles and a range of species. They are known for their proportion, refinement and detail. Perhaps most notable of his bonsai is a 7-tree Foemina juniper grove on a granite slab that was selected for photographic display in the 1999 JAL World Bonsai Contest. In February 2000, the tree was featured in an article in the Bonsai Shunju, the official publication of the Nippon Bonsai Association. Ted says one of his strengths is having a good eye for selecting material. A primary goal in his lectures and demonstrations is to help others improve their own abilities to recognize potential bonsai stock. And, he works to help people understand how to realize that potential through creative design and proper styling techniques. 2 John Naka awards from Descanso Bonsai Society. I started teaching before most of the current competitions were started and haven’t entered any.